Another book that I think was bought by/for my brother Ken. 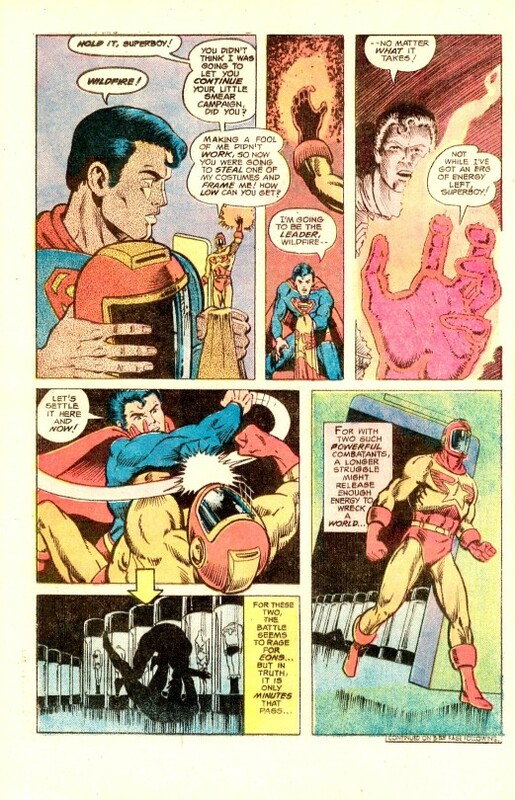 I was not much of a fan of SUPERBOY AND THE LEGION OF SUPER-HEROES at this point. As I’ve expressed previously, like other titles outside of the Julie Schwartz stable, it felt different to me in a way that I didn’t really care for. I’d go back to it from time to time for years, but it really wasn’t until the turn of the decade that I’d become a regular reader. During this period, a number of different people were contributing stories to S&LSH. 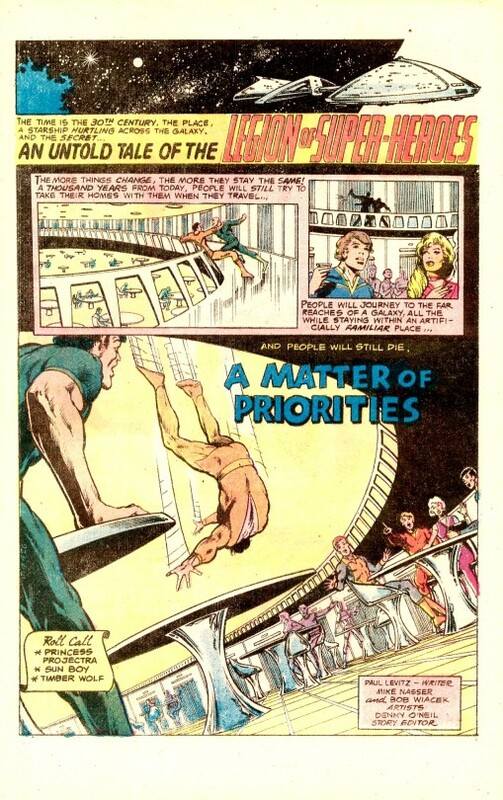 This particular issue was written entirely by Paul Levitz, who would go on to have a long history helming the series. But at this point, he was just a kid starting out, not really all that much older than I was. This particular scan is worth talking about, as it illustrates just how crappy the printing of comic books was at this point, due in part to the change from metal to plastic printing plates. Look at those credits–you virtually can’t make them out. Depending on where a particular book was in the print run of a given title, this sort of mush was a frequent occurrence throughout the 1970s. This issue opens up with an angry Superboy disrupting the swearing-in ceremony of new Legion leader Wildfire. 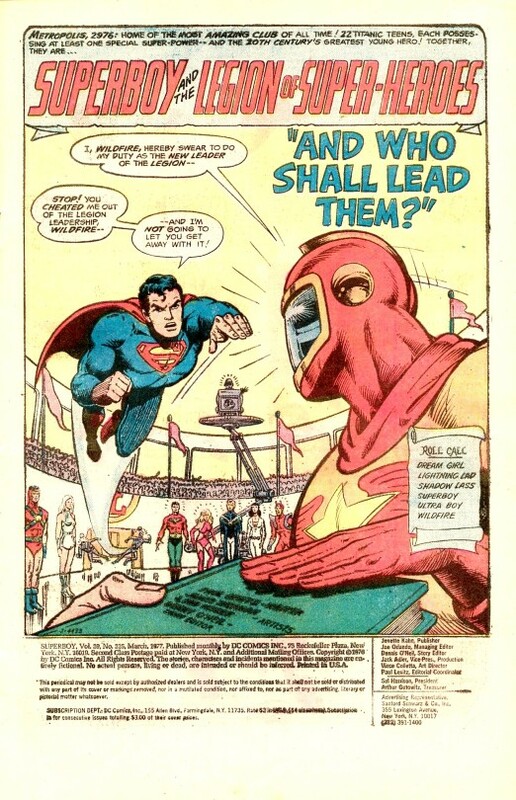 Turns out that the Boy of Steel was actually the top vote-getter, but given that he spent most of his time in his native 20th Century, he was ruled ineligible for the job, which went to Wildfire as teh number two candidate. (You’d have thought they’d have worked out the rules for eligibility BEFORE Superboy ran his campaign.) Either way, Superboy is uncharacteristically unhappy about it–and if you’re up on your Legion history, you can guess why and how this tale wraps up. 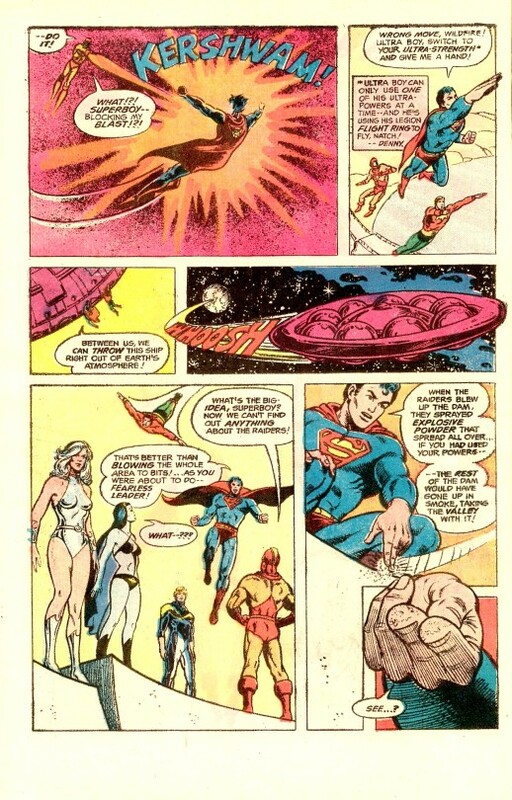 Anyway, Superboy storms off, and the Legion shortly after responds to an attack by the Resource Raiders, mysterious aliens who have been stealing the natural resources of planets throughout the U.P. Wildfire leads the team into action, but when he goes to employ his own energy powers, Superboy blocks his blast and commandeers control of the team. The Boy of Steel reveals that Wildfire’s discharge would have destroyed the very dam they were trying to defend. But subsequently, the Legionnaires compare notes and learn that there was no evidence of the explosive powder Superboy pointed out before he made his appearance. Curious. That night, a shadowy figure visits the Hall of Legionnaires intent on stealing the spare Wildfire costume stored there. Wildfire himself interrupts the burglar, who is of course Superboy himself. They two fight it out–and it’s unclear whether the solitary figure that emerges from the scuffle is Wildfire himself or Superboy clad in his costume. This figure leads the Legion on a counterattack of the Resource Raiders (and dodges questions about how he knew where to find them in orbit without telescopic vision) and fights physically like Superboy before getting blown to smithereens by the enemy. Superboy appears moments later, and while wrapping up the Raiders, reveals that it was truly Wildfire who was felled. 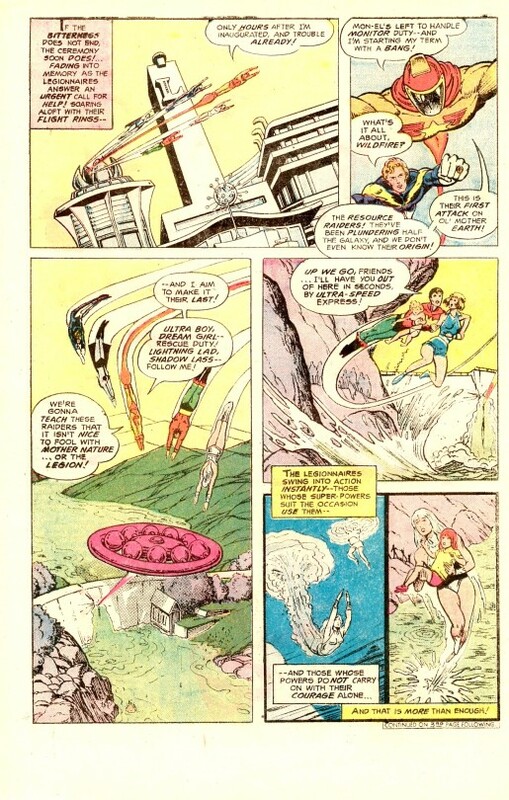 The Legion’s computer had predicted that the new leader would be killed in his first major battle (shades of the death of Lightning Lad a decade earlier) and so Superboy tried to force his way into the role, assuming he’d be the toughest to kill. But the computer had made a mistake, assuming that Superboy would win the election (as he did) and that he’d be killed by the Kryptonite in the blast. As a dis-corporate energy being, Wildfire is just fine, and the two heroes patch up their differences. S&LSH was still running back-up stories at this point, despite the fact that this sheer size of the Legion demanded longer stories. 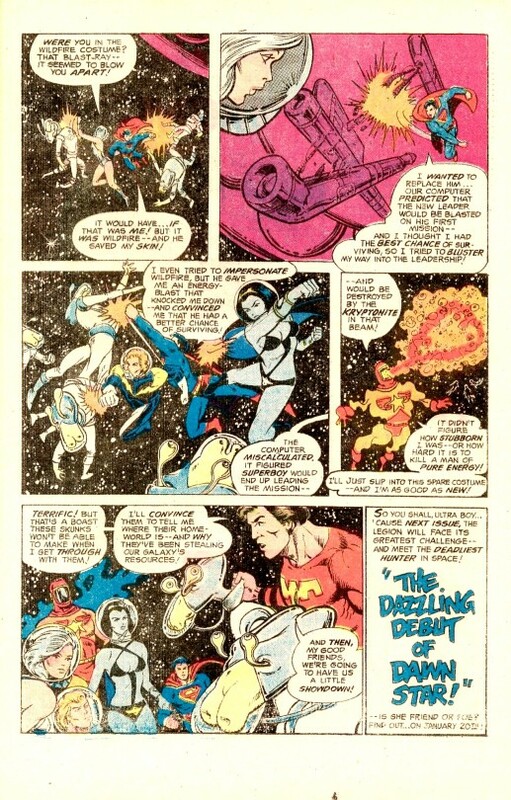 So the rest of the issue was devoted to a 6-page short in which Princess Projectra, Sun Boy and Timber Wolf simulate a demonic attack on an intergalactic starliner so as to lure out a superstitious serial killer without revealing their identities, as they’re also secretly body-guarding a diplomatic envoy whose presence cannot be revealed. It’s a nice, tight little tale, of the sort that you don’t much see in comics anymore.